The epic western adventure continues as Warner Home Entertainment Group releases How The West Was Won: The Complete Second Season on DVD July 15, 2014. Originally broadcast in 1978 and based on the 1962 film of the same name, the second season of this classic television series features an all-star cast including James Arness (Gunsmoke), Eva Marie Saint (On the Waterfront, North by Northwest) and Bruce Boxleitner (Scarecrow and Mrs. King, Tron) as well as notable guest stars Ricardo Montalban, William Shatner, Tim Matheson, and Lloyd Bridges. This six-disc set includes all 14 parts of the 1978 season and more than twice the content of Season One on DVD. 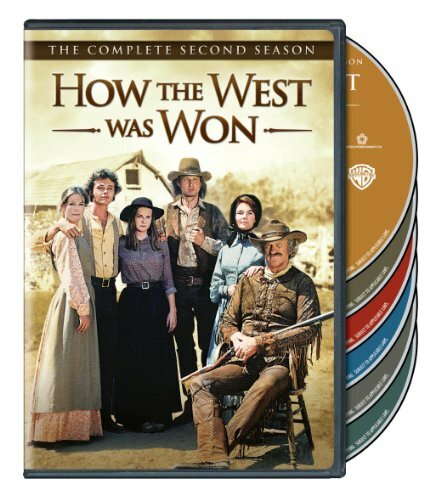 How The West Was Won: The Complete Second Season is priced to own on DVD at a $39.98 SRP. The year is 1868 and representatives from the Russian court on visit, want to experience a buffalo hunt. Zeb is ordered to be a pathfinder for the Russians but refuses because the buffalos are on the brink of extinction and one of the most important resources for the Indians. Another pathfinder, far more ruthless than Zeb, takes the job and immediately conflicts arise. Zeb must step in to solve the problems. A new person is introduced; Aunt Molly comes to live on the farm of the Macahans. Zeb arranges an exchange of the captive Russians, but the conflict escalates when one of them is killed. Zeb joins the Indians but the American army plans a major attack. On the Macahan farm they get a visit from a Mormon couple who have trouble in the region because of their religion. Aunt Molly invites them to stay a few days and Laura is charmed by the handsome Jeremiah. Luke helps a sheriff and gets invited to his home. There he meets the sheriff's beautiful and temperamental daughter Hillary. Luke has to leave the sheriff and Hillary when his past is disclosed. On his way he helps a wounded woman by bringing help from a group of people who have made a fortification in the mountains. He is not allowed to leave the fortification. Zeb manages to lead the Indians to safer areas but the American army follows them. An old General, who is a friend of Zeb, makes sure that the Chief Satangkai gets a peace offer that may prevent war, but Satangkai chooses another path. Laura wants to marry Jeremiah and become his third wife. Aunt Molly, who is opposed to the marriage, arranges that Jeremiah's second, and much younger, wife come to the wedding. Luke attempts to prevent the ex-Confederate bandits from robbing a gold shipment. In the process, the gang's leader and Luke's friend, Curt Grayson, are killed. Zeb rescue a woman from two hide-cutters and discovers that the woman is his old girlfriend, Beth. Laura calls off the wedding to Jeremiah Taylor, while Jessie, stung by bees, may die. Zeb discovers that Beth is married to an army "hero" who is supposedly dead. The doctor can't help Jessie, so Zeb takes her to an Arapaho medicine man, who saves her life. Zeb and Luke find local Indians starving and agree to purchase a herd of cattle, delivering the animals to the Indian reservation with the help of Indian drovers. Molly and Jessie are returning home when their stagecoach is wrecked and Jessie, dazed, wanders into the desert. Molly is rescued by Josh and Laura, and she then hires Deek to find Jessie. Zeb and Luke hire Tap as the cook for the journey to the Indian reservation, not knowing that he is involved with a gang of rustlers. Jessie is found by Teel-O, a Navajo Indian. Deek is romantically interested in Molly, but she does not share the same feelings and resists his advances. A grateful Judge Rensen offers to try to grant Luke a pardon after he rescues him from Indians. Tap kills Otter Belt to keep him from telling Zeb about the rustlers. Deek bribes a land agent to seize ownership of the Macahan creek and the gold therein. Josh arrives in Las Mesas to help Luke's case and falls in love with Doreen. Stillman hires Francis, Doreen's boss, to help convict Luke. Tap confesses the truth to Zeb and is then killed in a gunfight. Luke's trial begins and it looks bad for him when Frank Grayson produce proof that Luke was a member of the outlaw gang and Judge Rensen is found murdered. Doreen tells Zeb about Francis and Stillman. Josh is attacked by Stillman and his men, and Molly defends herself against Deek.